Cake: Preheat oven to 350°F. Spray two 8-inch round baking pans with baking spray and line the bottom with a round of parchment paper. Combine all cake ingredients in a large mixing bowl. Beat with an electric mixer for 30 seconds on low to combine. Scrape down bowl and increase mixer speed to medium and beat for 2 minutes. Equally divide batter among the two pans. Bake for 29-34 minutes, until a toothpick inserted into the center of a cake comes out clean. Cool in pan for 10 minutes and then turn out onto a cooling rack and allow to cool completely. Pink Champagne Buttercream: Beat butter until light and fluffy. Add powdered sugar and 1/2 cup of pink champagne. Beat on medium high speed until well combined and fluffy. Add additional champagne if the frosting feels too thick. Assemble Torte: If needed, cut the domed top off the cakes. Cut each cake into 2 equal layers. Set one layer on a cake plate. Repeat, adding 3 more cake layers and frosting on top of each. If using, sprinkle some candies on top of the cake. This torte is perfect for when you want to serve a festive looking (and wonderful tasting) cake for a special occasion but don't have all day to spend decorating. Just bake, layer, frost, and serve. That's it! 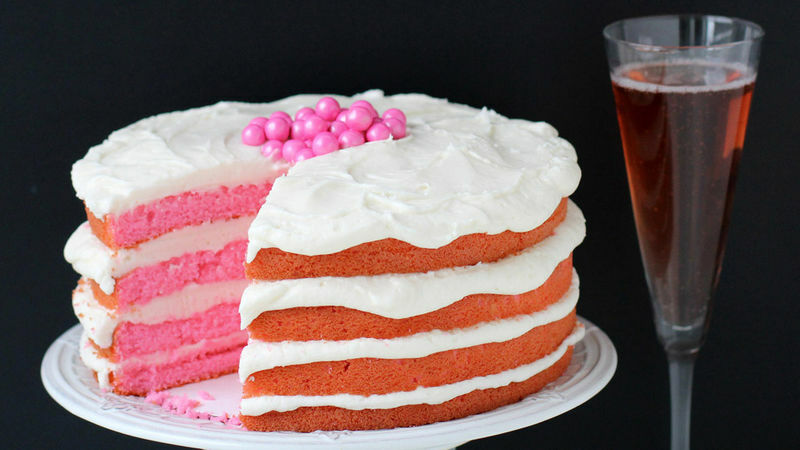 You don't even have to frost the outside of the cake—just allow those naked layers of bright colored pink cake to be exposed. The edges are golden brown but when you cut into it, the contrast of pink cake against white frosting is beautiful. This would be a wonderful dessert to serve at a bridal shower, baby shower or birthday party! Making a bright pink velvet cake with a hint of chocolate flavor means you'll need to add some chocolate extract to your cake mix ingredients. (The extract won’t add brown color like cocoa powder would.) If you prefer a plain white cake, just eliminate it. Once you make the cake mix, equally divide it among two 8-inch round pans. Pop the cakes in the oven and bake until a toothpick inserted in the center comes out clean. Cool the cakes in their pans for 10 minutes, then turn out onto a cooling rack and allow to cool completely. While the cakes are cooling, grab your powdered sugar, softened butter, and a bottle of pink champagne and make the buttercream frosting. It's easiest to whip the butter until light and fluffy and then add the powdered sugar and champagne and beat until creamy. When the cakes are cooled, cut the domed tops off and cut horizontally into two equal layers. Set one cake layer on a cake plate and spread (or pipe) about 1/4 of the frosting over the first layer. Add another cake and more frosting. Repeat, creating a 4-layer cake. Add a touch of pink color to the top by sprinkling on some round pink candy coated chocolate candies in the center of the cake.